Peter Reginald "P. R." Toews: minister, teacher and conference leader; born 29 August 1916 in Waldheim, Molotschna Mennonite settlement, South Russia to Peter Aron Toews (28 October 1890 - June 1921) and Aganetha (Unrau) Toews (d. June 1921). He married Lydia Elaine Janz (b. 23 March 1918, Orloff, Molotschna, South Russia) on 17 April 1941 in Coaldale, Alberta. Lydia was the daughter of Jacob B. Janz (13 June 1884 - 30 August 1972) and Aganetha (Wiens) Janz (11 January 1887 - 3 December 1971). Peter and Lydia had four children: Victor, Ruth, Elfrieda and Peter. Peter died 15 January 2005 in Abbotsford, British Columbia. When Peter was five years old his parents were killed in a Russian civil war skirmish. Peter and his three siblings were orphaned by this tragedy and placed in homes of close relatives. Peter and his brother Victor came to the home of their uncle and aunt, Abram A. Toews (1887-1962) and Helena (Janz) Toews (1894-1993). They immigrated to Canada in 1926 and settled on irrigation land in Coaldale, Alberta. Much to his regret, Peter was never to see his oldest sister again. Peter was in his late teens when he accepted Christ as his personal Saviour. Subsequently he attended the Coaldale Bible School for three winters and the Prairie Bible Institute for one year. He was baptized on 25 July 1937 in the Coaldale Mennonite Brethren Church. After farming for five years, Peter felt called to the ministry and moved to Winnipeg to prepare. He studied simultaneously at the Mennonite Brethren Collegiate Institute to complete his high school certification, and at the Mennonite Brethren Bible College for his theological education. During this time he spent two years as speaker of the Gospel Light Hour radio program. 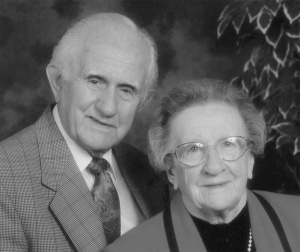 Peter began his ministry as a teacher at the Coaldale Bible School (1949-1952). He then went on to pastor the Hepburn Mennonite Brethren Church, Hepburn, Saskatchewan (1952-1956), Fraserview Mennonite Brethren Church in Vancouver, BC (1956-1963), and Dinuba Mennonite Brethren Church in Dinuba, California (1963-1967). He returned to teaching in 1967, becoming an instructor at Mennonite Brethren Bible Institute (later Columbia Bible Institute) in Clearbrook, British Columbia. He served the school for a decade, including eight years as president (1969-1977). During his presidency, the Mennonite Brethren Bible Institute merged with the Bethel Bible Institute (a school owned by the BC Conference of Mennonites) to become Columbia Bible Institute. Next came a call from Elmwood Mennonite Brethren Church in Winnipeg where he served as pastor from 1977 to 1980. He was appointed conference minister for the Canadian Mennonite Brethren Conference in July 1980 and served until the end of 1981. Peter then returned to BC where he served for a second time as pastor of Fraserview Mennonite Brethren from 1982 until 1984. He completed his formal ministry with two pastorates at the Philadelphia Mennonite Brethren Church in Watrous, Saskatchewan (1984-1986) and Armstrong Gospel Chapel in Armstrong, British Columbia (1987-1988). Throughout the years of his public ministry, Peter was entrusted with many conference leadership positions. Over time he served the Saskatchewan (1955-1956), British Columbia (1957-1959, 1961-1963), Pacific District (1966-1967), and Canadian (1977-1980) Mennonite Brethren Conferences as moderator. He also served on the Canadian Mennonite Brethren Conference Board of Reference and Council as well as the Board of Christian Literature. He was also the first fully remunerated pastor in a Mennonite Brethren congregation in western Canada. Peter served the Mennonite Brethren Conference for more than four decades as a pastor, teacher, conference leader and evangelist. He loved the church and felt honored to serve the Lord in these capacities. Mennonite Brethren Herald 44 (18 March 2005): obituary. Thiessen, Richard D. and John B. Toews. "Toews, Peter Reginald "P. R." (1916-2005)." Global Anabaptist Mennonite Encyclopedia Online. July 2005. Web. 18 Apr 2019. http://gameo.org/index.php?title=Toews,_Peter_Reginald_%22P._R.%22_(1916-2005)&oldid=142848. Thiessen, Richard D. and John B. Toews. (July 2005). Toews, Peter Reginald "P. R." (1916-2005). Global Anabaptist Mennonite Encyclopedia Online. Retrieved 18 April 2019, from http://gameo.org/index.php?title=Toews,_Peter_Reginald_%22P._R.%22_(1916-2005)&oldid=142848. This page was last modified on 8 January 2017, at 17:20.